When considering ways to enhance the field trip experience for students, teacher and tour director, Faye Brenner comments on the importance of providing purposeful ways for students to reflect on the experience. 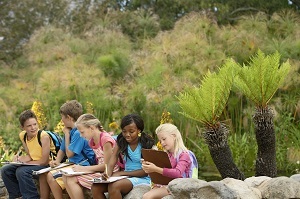 A field trip, like the classroom experience, must be student-centered and inquiry-based. We can maximize the educational value of field trips by slowing down the experience and, in doing so, helping the students see with new eyes. Educational research supports the fact that students learn by doing and that not all students learn in the same way; therefore, the field trip experience should reflect the various ways of learning. It must be interactive, and not didactic. * recreate a scene from a piece of art. Imagine students on a school trip to Washington, D.C., experiencing its iconic memorials. When they get back to the classroom the students work in groups to create their own memorial, share its purpose and design with the rest of the class, and together they vote on a “new” memorial to add to the landscape. Students are engaged in a cross-curricular activity, writing a proposal and description, creating a piece of art, and discussing social issues. The use of social media on field trips can be controversial, but, when used with purpose, it can enhance the educational experience, allowing students to reflect on their experience. For example, teachers can create an Instagram account for their field trip, and students can add photos and captions. On a visit to a history museum students can choose one artifact that they believe played an essential role in history and upload it with a caption explaining its significance. Back on the bus, students can share their post with their seat partners. Ask the students to share what they learned from their partners. Most museums and historic places offer teachers excellent resources that can be accessed before and after the field trip; teachers should take advantage of those educational resources. Many sites also offer virtual tours that educators can use with their students to preview the visit or as a follow-up to the experience; these virtual tours are also a great way that students who may not be able to participate to have their own virtual field trip. As we do in the classroom, share the objectives and the expected outcomes with the students. Give the field trip a specific focus: rather than a tour of the Museum of Modern Art in New York City, explore social change through art. From Education Week, Great Field Trips Expand the Mind,’ by Larry Ferlazzo on December 14, 2016.